Erik (along with Manuela Müller and Christian Rödelsperger, also in the lab) explores the mechanisms by which developmental plasticitymight lead to phenotypic diversity. He does it in the context of examining a strange mouth-form polyphenism in our lab’s favorite nematode, Pristionchus pacificus. In all inbred strains collected in the wild, a certain proportion of the population has a narrower, presumably bacterial feeding mouthform (stenostomatous) and the rest of the population adopts a toothier and wider mouthform (eurystomatous). Turns out, the toothier form is much better at killing other nematodes and utilizing them as a food source. To see this toothier mouthform in action, check out THIS VIDEO I posted a while back on YouTube. Even more interestingly, the ratio of each mouthform has been shown to be regulated by environmental conditions such as food availability and population density. Erik started by doing a genetic screen for animals that lose the toothy eurystomatous mouthform. By doing so, he identified a dominant locus that seemed likely to regulate plasticity in mouthform and bestowed upon it the name eud-1. 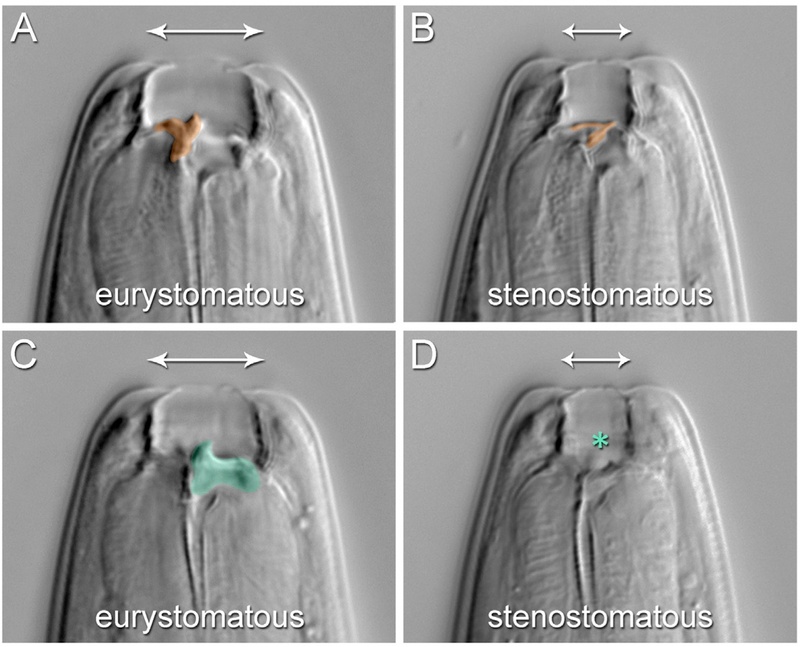 Turns out that eud-1 encodes an arylsulfatase that has a homologue in C. elegans, but we don’t know anything about its function in that animal. Though we don’t know the target, he was able to demonstrate that it acts in a dosage dependant manner… the more the expression, the more toothy predatory mouthforms you get in the population. Being a good comparative biologist, it would have been strange for Erik to stop there. He additionally shows that this sulfatase functions similarly in multiple wild isolates as well as in the closely related species Pristionchus exspectatus. In P. expectatus, they were able to locate an inbred strain that does not produce any eurystomatous individuals and has very low levels of eud-1 expression. The species can be crossed, so he did so and was able to show that crossing with eud-1 mutants had no effect but crossing with wild type recovered the eurystomatoud mouthform. Of course, I was most excited when they were looking at the expression pattern of the sulfatase and found that it is expressed in neurons. Some of the neurons are located where the cell bodies for some of the more important sensory neurons are, suggesting that possibly eud-1 is sensory-mediated endocrine signaling. Cool! Previous work had shown that this mouthform is influenced by pheromone signaling. Erik was able to show that eud-1 mutants do not change their mouthform frequencies in response to pheromones. In summary, Erik started with a system with a cool evolutionary novelty in the form of a mouthform polyphenism, identified an unusual gene (sulfatase) that is responsible for regulating this polyphenism, showed that it works across species and also showed expression patterns implicating the nervous system and possibly endocrine signaling. Nice piece of work, check it out HERE. Also, see the commentary by Volker Hartenstein and David Jacobs HERE. This entry was posted in Nematode, Pristionchus pacificus, Science, Sommer Lab. Bookmark the permalink.